Now that we have official election results from nearly every state, we wanted to offer some closing thoughts on election 2012. So here are 10 bite-sized nuggets, an appetizer for your holiday feasts. As a programming note, we're taking the next two weeks off to recharge for the next cycle. Our next issue of the Crystal Ball will hit your inboxes on Thursday, Jan. 10, 2013. From all of us here at the University of Virginia Center for Politics, we wish our readers Happy Holidays and a Merry Christmas. One of these days we'll have another 2000-style election, where the result will be so tight that we will not know the outcome on the election evening -- or for many days thereafter. Consider New York State -- which a month and a half after the fact still has not certified its election results. (We remember Superstorm Sandy, but New Jersey was hit just as hard.) Even a critical New York state Senate race remains up in the air: George Amedore (R) has a 39-vote lead on Cecilia Tkaczyk (D), who is not conceding 1 and is likely to appeal a court decision that appeared to make Amedore the winner. Our nation now takes two months to vote, and two months to count the votes. This is unacceptable. It is unwise for balloting to start so many weeks before Election Day -- before the campaign has truly unfolded and many useful revelations about the candidates have unfolded. Millions of voters are writing their review of a four-act play after the second act. Worse is our seeming inability, a dozen years after Florida, to eliminate problems in the administration of the voting process and the actual counting of the votes. Examples abound, including poorly functioning equipment, the cavalier discarding of absentee ballots with the slightest imperfections, the inability to get ballots to members of the armed forces in a timely fashion, and the refusal to set up enough polling stations for the crowds that inevitably materialize on Election Day. We encourage all states to further streamline their voting rules. First, let's concentrate all early voting in the last two or three weeks of the campaign, after all the debates, so voters get the full picture, more or less. Second, add no-fault absentee voting everywhere, so that voters can get an absentee ballot without needing to provide a reason for why they are voting early. Third, open all polls beginning on the Saturday before the Tuesday election. Let people come and vote at their convenience over four days; no one can justify the current inadequate situation in many states that forces voters to wait for four or six or eight hours in line in order to cast a ballot. Maybe it is just poor planning, but one suspects it is an attempt in some states and localities to discourage voters and reduce turnout. If time is money, then this is a new poll tax -- just as onerous and despicable as the original one. We're certain there are other useful reforms, too. The point is, our current voting system is a disaster waiting, yet again, to happen. Can't we do something now to head off a future crisis? It is manifestly in our national interest. We all know 2012 was a partisan, polarized election -- and every region performed according to the modern script. President Obama's victory was predicated on maintaining support in the heavily Democratic portions of the country (the Northeast and Pacific West) while edging Mitt Romney in the Midwest. Romney's strength in the Greater South, the Plains and the Inner West was not enough to overcome the incumbent. Notice that the overall Democratic landslides in the Northeast and Pacific West are much larger than the GOP victory margins in the South, Plains and Rocky Mountain states. Below is a chart that shows regional voting in 2012. Notes: *Many localities in New York have still not finalized their numbers due to delays stemming from Superstorm Sandy. Most other states have finalized their numbers although some may have discrepancies due to write-in votes. Percentages will not add up to 100% due to votes for third-party candidates and write-ins. Obama's edge on the coasts helped give Obama 190 of the 193 electoral votes within those regions (Alaska went to Romney), and Obama's huge wins in California and New York were pivotal in his nearly 5 million popular vote edge. With the 80 electoral votes he won in the Midwest, Obama had 270 electoral votes without even considering the South or Inner West, where he added Colorado, Florida, Nevada, New Mexico and Virginia. Nationally, the president won about 1.9% less of the popular vote in 2012 than he did in 2008 (52.9% versus 51.0%). Therefore, he did worse in most states around the country. But there were five states where Obama actually improved upon his 2008 performance. Among the 26 states he won, Obama saw his vote share go up by a bit more than 1 percentage point in New Jersey and by a negligible 0.05 points in Maryland. The other three states where Obama's portion of the vote grew were Louisiana (+0.65), Mississippi (+0.79) and Alaska (+2.92), where the absence of Sarah Palin probably led to the slight Democratic addition. 4. How important was the ground game? There have been endless articles written on the superiority of the Obama campaign's ground game vis-à-vis the Romney field operation, especially in the battleground states. However, when looking at the numbers, just how impactful was it? Of the eight states the Crystal Ball long viewed as the key swing states in the 2012 election, Obama's performance fell by more in five of them than did his national percentage, while in three states his percentage fell by less than his national fall-off. An argument could be made that if the Obama field operation was truly game-changing, it would have lessened the general decrease in support for the incumbent in most or all of these important states. 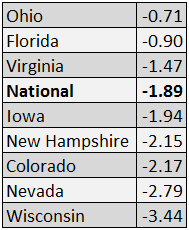 If we expanded this list to include North Carolina (-1.35) and Pennsylvania (-2.52), Obama's percentage would still have fallen off by greater than the national average in six of 10. Then again, perhaps the fact that Ohio, the most-heavily targeted state by both campaigns, saw the smallest drop-off for the president of the eight is an indication that Obama's field operation did have a significant effect there (perhaps combined with the auto bailout). If we look at the 26 states plus D.C. that Obama won, Obama's portion of the vote fell off by more than the national mark in 12 while it fell off by less or even went up in the other 15. Prior to the election, there was a lot of buzz about President Obama potentially doing much better in Arizona than in 2008; at the high tide of Obama's post-convention honeymoon, there was even a report indicating that the Obama campaign was considering making a serious play there 2. That would have been money poorly spent; despite the lack of a favorite son on the ballot (Arizona Sen. John McCain was on the 2008 ballot), the Grand Canyon State's election results hardly changed from 2008 to 2012: McCain won it 53.4% to 44.9% four years ago, and Mitt Romney won it 53.7% to 44.6% this time -- actually improving on McCain's performance (though Arizona saw less of a drop-off for the president than the nation as a whole). While a growing minority vote could make typically Republican Arizona competitive in future elections, the state's voting as a whole became more racialized in 2012: According to exit polls, 66% of white voters picked Romney, up from the 59% of voters who picked McCain in 2008 (those voters made up about three-fourths of the electorate in both elections). On the other side of the ledger, 56% of Hispanics backed Obama in 2008, but 74% backed him in 2012 (Hispanics accounted for 18% of all voters in 2012 and 16% in 2008). If white voters become more Republican as the Democratic-supporting minority population grows -- a distinct possibility given the state's divisive immigration-influenced politics -- Arizona probably won't change all that much at the presidential level in the near future. Missouri -- a state that prior to 2008 had correctly picked the winner in 25 of 27 presidential elections -- has now gone Republican, against the national winner, in two straight presidential contests. Its days as a bellwether are probably over: Its Obama percentage dropped almost five points from four years ago, or more than double the national average. On the flip side, Georgia, Mississippi and South Carolina stand out as states where Obama either didn't slide as much as the nation as a whole (Georgia and South Carolina) or, as mentioned above, slightly improved from 2008 (Mississippi). But Obama maximizing his vote in states with large black populations probably explains his high floor of support in these conservative states. It is unlikely, at least in the short run (the next few elections), that Democrats will find a way to get to a presidential plurality in these states. While Obama achieved a notable victory, he was the first president to win a second term without adding a new state to his coalition. 6. North Carolina: A national outlier? The 2012 election was generally an affirmation of the status quo across the nation, but one state dramatically shook things up, at least on the surface: the Tar Heel State. North Carolina was the only state in the union to not only change its vote for president but also the party of its governor. Mitt Romney narrowly carried North Carolina in 2012 after President Obama far more narrowly captured it in 2008, and former Charlotte Mayor Pat McCrory (R) broke a 20-year Democratic hammerlock on the governor's office by defeating Lt. Gov. Walter Dalton (D) in an open seat contest. Republicans also gained three U.S. House seats, a redistricting-aided achievement that marked their biggest net gain in any state. Now, granted, this is a very limited category -- Indiana is the only other state to change its presidential vote in 2012, and it also changed the party of one of its statewide officeholders: Sen.-elect Joe Donnelly (D) will replace Sen. Richard Lugar (R), thanks in large part to the latter's primary defeat. But Indiana kept its governor's office Republican by electing Rep. Mike Pence (R) to what is effectively outgoing Gov. Mitch Daniels' (R) third term. It should be noted, though, that Pence won the statehouse far more narrowly than expected; Pence beat Democrat John Gregg by a mere three points. Ultimately, North Carolina's shift, at least at the presidential level, was actually less dramatic than the nation as a whole -- as noted above, Obama performed 1.9 percentage points poorer in the national vote compared to 2008, while in North Carolina, he only performed 1.35 points worse (49.70% in 2008 vs. 48.35% in 2012). It just proves again that in an election so closely mirroring 2008, one has to look hard for states that substantially deviated from the national norm. How did Democrats manage to add two seats in the Senate this cycle? The national voting totals for Senate races tell the tale: Democrats won 54% of all Senate votes cast around the country on Nov. 6, a figure that doesn't include the totals of Sen. Bernie Sanders (I-VT), who won 75% of the vote in his race, or Sen.-elect Angus King (I-ME), who won 56%. Of course, this is not an apples-to-apples comparison with the House because only one-third of the Senate was up for reelection (and many of those seats favored Democrats). Still, the Senate vote totals demonstrate the edge Democrats had this cycle in the upper chamber. In 20 of the 33 contests, Democratic Senate candidates ran ahead of Barack Obama, yet Republican candidates ran ahead of Mitt Romney in only nine contests. In the other four, both major-party candidates ran behind their presidential standard bearers, with the previous caveat for Maine and Vermont. Of the 20 races where Democrats ran ahead, Romney won eight of those states at the presidential level -- and Senate Democrats carried five of the eight: Indiana, Missouri, Montana, North Dakota and West Virginia. Sen.-elect Joe Donnelly (D-IN) ran 6.1 percentage points ahead of Obama, Sen. Claire McCaskill (D-MO) ran 10.4 points ahead, Sen. Jon Tester (D-MT) ran 6.9 points ahead, Sen.-elect Heidi Heitkamp (D-ND) ran 11.5 points ahead and, towering above them all, Sen. Joe Manchin (D-WV) ran 24.9 points ahead of the president. On the flip side, although Republican winners in Mississippi, Nevada, Tennessee and Wyoming all ran ahead of Mitt Romney, only the Nevada race was considered competitive. And there, Sen. Dean Heller (R-NV) edged Romney by just 0.2 points. While results are still not 100% final, the general election night consensus -- that Republicans won the U.S. House despite losing the national popular House vote -- was confirmed. According to our running tally, Democratic House candidates won a bit over a million votes more than Republican House candidates, or about 49.1% of all votes cast to 48.2% for the Republicans (and about 2.8% for third-party candidates). The Democratic advantage should inch up a little because the outstanding votes are largely from the heavily Democratic New York City area. Redistricting can account for at least some of the Republicans' ability to win the House without winning the House popular vote: The Brennan Center for Justice at New York University School of Law recently found 3 that redistricting allowed the Republicans to win six more seats than they would have before the most recent round of redistricting. Beyond redistricting, another factor in the popular vote discrepancy is that Democrats, partially because of redistricting but also because of lifestyle choice, appear to be clustered closer together than Republicans, which helps dilute the minority party's House performance. Political scientists Jowei Chen of the University of Michigan and Jonathan Rodden of Stanford University have argued 4 that this clustering puts Democrats at a structural disadvantage in House races: “In many states, Democrats are inefficiently concentrated in large cities and smaller industrial agglomerations such that they can expect to win fewer than 50 percent of the seats when they win 50 percent of the votes,” they write. The House election results also confirmed what we suspected before the election: Reapportionment, the shifting of seats from slower-growing states to faster-growing states after the census, was a wash.
Illinois (-1 R): Outgoing Rep. Don Manzullo (R), who lost a member vs. member primary to Rep. Adam Kinzinger (R). Iowa (-1 D): Outgoing Rep. Leonard Boswell (D), who lost a member vs. member race against Rep. Tom Latham (R). Louisiana (-1 R): Outgoing Rep. Jeff Landry (R), who lost a member vs. member race against Rep. Charles Boustany (R). Massachusetts (-1 D): Retiring Rep. John Olver (D). Michigan (-1 D): Outgoing Rep. Hansen Clarke (D), who lost a member vs. member primary to Rep. Gary Peters (D). Missouri (-1 D): Outgoing Rep. Russ Carnahan (D), who lost a member vs. member primary to Rep. Lacy Clay (D). New Jersey (-1 D): Outgoing Rep. Steve Rothman (D), who lost a primary to Rep. Bill Pascrell (D-NJ). New York (-1 D, -1 R): Retiring Rep. Maurice Hinchey (D-NY) and outgoing Rep. Bob Turner (R-NY); Turner, who won ex-Rep. Anthony Weiner's (D) old seat in a ballyhooed special election triumph in 2011, saw his district carved up in redistricting. He ran for Senate, but lost the Republican nomination. Ohio (-1 D, -1 R): Retiring Rep. Steve Austria (R) and outgoing Rep. Betty Sutton (D), who lost a member vs. member race against Rep. Jim Renacci (R). Pennsylvania (-1 D): Outgoing Rep. Jason Altmire (D), who lost a primary to outgoing Rep. Mark Critz (D). Critz then lost the general election to Rep.-elect Keith Rothfus (R). Arizona (+1 D): Rep.-elect Kyrsten Sinema narrowly captured this seat, which should remain competitive going forward but is also more Democratic than the state as a whole. Florida (+2 D): Reps.-elect Alan Grayson and Lois Frankel (D) effectively won the state's new seats; Grayson's seat is pretty Democratic, though he is a firebrand capable of kicking it away in a really bad Democratic year. Frankel's seat is more competitive but she should be in a good position to hold it going forward. Georgia (+1 R): Rep.-elect Doug Collins' (R) only threat will come in a primary in this new, heavily Republican seat. Nevada (+1 D): Rep.-elect Steven Horsford (D) had a difficult election, but this probably won't be a great Republican target going forward. South Carolina (+1 R): Rep.-elect Tom Rice (R) only won by about 10 points against a sub-par Democratic opponent; this is a long-shot Democratic possibility going forward. Texas (+3 D, +1 R): All four seats are safe for the new incumbent party. Utah (+1 R): Rep.-elect Chris Stewart (R) captured this utterly safe Republican district. Washington (+1 D): Rep.-elect Denny Heck (D) shouldn't have too much trouble going forward. So while these 12 districts changed locations, they didn't really change parties. The Congress might be becoming more diverse 5, but it still doesn't look much like the voters who pick its members. Of 533 members of the House and Senate listed here (there are two vacancies, described in the notes below Chart 3), 83% are white and 17% are nonwhite, compared to a 2012 electorate that was 72% white and 28% nonwhite, according to exit polls. That disparity is far less striking than the breakdown of men and women in Congress: Women made up 53% of the 2012 electorate, but make up only 18% of the members of Congress. Because he has not yet been officially appointed to the Senate, Rep. Tim Scott (R-SC) is listed here as a member of the House. When he takes over for the departing Sen. Jim DeMint (R-SC), he will be the only black member of the Senate. Notes: Sen. Daniel Inouye (D-HI), who died earlier this week, and ex-Rep. Jesse Jackson Jr. (D-IL) are not included in this chart because their seats are open, so the total number of members of Congress included here is 533, not 535. Sources: Crystal Ball research; House Press Gallery's House Lineup 6.